Two of Indiana's leading ladies dive into the historic hot dog. How do you help more people realize you've been around for fifty years, are proud of it, and intend to be around for at least 50 more years? If you are the Indiana 4-H Foundation, you put together a well-organized media event that showcases your achievements, with enough uniqueness and celebrity power to draw coverage. Their planning paid off - the ag media showed up in force to an event far off the beaten path. Sections of the formerly 50-foot hot dog were shared with 50 4-H youth from Fountain Square Academy along with celebrity hot dog tasters First Lady Cheri Daniels and Miss America 2009 and 4-H alumna Katie Stam. 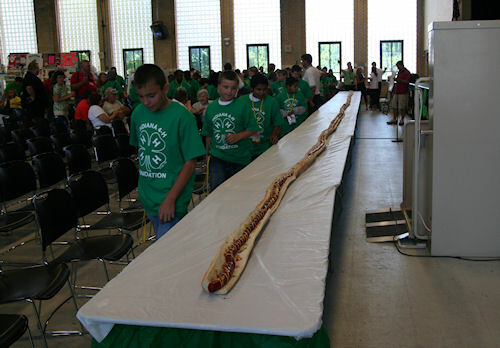 During the Indiana State Fair, continuing this week, the Indiana 4-H Foundation with the help of King David's Dogs and Bartow Catering, constructed a 50-foot long hotdog sandwich in the auditorium of the 4-H exhibit hall. King David's Dogs has a restaurant in downtown Indianapolis and other locations. Bartow Catering cooked the huge links of old-fashioned, big-red style hot dogs, then employees placed the hot dogs in buns that placed end to end, ran a full 50 feet in front of the stage at the auditorium. The event was the brainchild of former Miss America 2009, Katie Stamm, herself a 10-year 4-H member form Jackson County, notes Shelley- Bingle-Coffman, executive director of the Indiana 4-H Foundation. "We were brainstorming for ways to draw attention to our celebration and get the word out," Bingle-Coffman says. "Katie came up with this idea and we were able to carry it out." Those taking the first bites of the giant hot dog included 50 young 4-H'ers, most of them form the Fountain Square Academy in Indianapolis. Renee McKee, of the Indiana 4-H state staff, says that 4-H has three clubs in that urban area. The kids there are especially interested in science, she notes. For many, it was their first trip to the state fair. Two Indiana celebrities also chowed down on the first bite festivities. They included Stamm and the first lady of Indiana Cheri Daniels. The Governor's wife was there to show her support for Indiana 4-H as well. "The Foundation was formed in 1962 to raise money for scholarships for the young leaders in our state and that is still our number one goal," says Bob Grimm, president of the Indiana 4-H Foundation. Grimm hails from Boone County. The president noted that the Foundation authorized more than $75,000 in scholarships this past year alone. The main revenue source for the Foundation is private and company-based donations. Earlier in the fair, Pioneer presented a check to the Foundation for $20,000. Wal-Mart was also scheduled to make a public presentation of a donation to the Foundation during the state fair.